Each SlideFile™ Storage System includes a slide box and a removable tray. 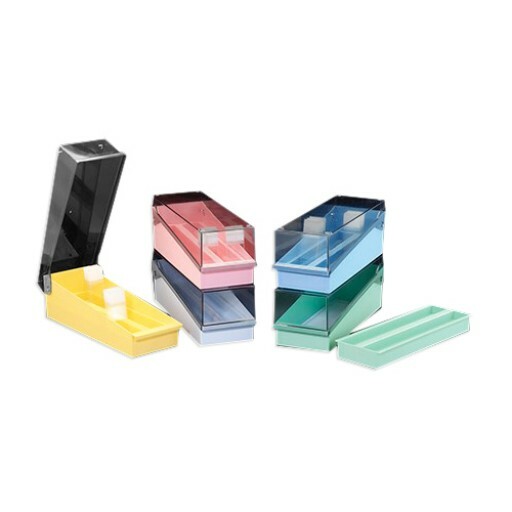 A tinted hinged cover makes the contents of the box easy to see at a glance.The base is available in five different colors to help in slide classification and to minimize the possibility of sample mix-up. The key to the SlideFile™ System is a removable tray inside the storage box having a hundred individual numbered slots. All slides are stored upright for easier insertion and removal. Simply tilt them forward and backward with one finger to easily and rapidly pick up the slide you need. A unique feature with this system is to be able to read bar codes without having to remove the slides from the box. For space saving purposes, you can double the amount of slides simply by storing two slides per slot. For maximum storage space, simply remove the tray and line up 400 slides in 3 rows for long term storage. Will resist temperatures between -80 °C and +80 °C. Not autoclavable.